Whether it’s to add strength to lighter gauge material, create an emboss to provide additional clearance for a feature or hardware, or add visual or cosmetic enhancements, Mate’s Rollerball is a highly versatile tool. Some of these applications allow the fabricators to use thinner material or eliminate secondary operations, resulting in material and labor cost savings, and reduced production time. The Mate Rollerball is designed to be used in machines that can hold the ram down while simultaneously moving the sheet around in the X and/or Y axis. When used in machines with accurate stroke control, a simple adjustment to the machines stroke length can create a deeper or shorter form. In other thick turret machines, using the Mate Rollerball in a Mate Ultraform holder offers easy adjustability; simply change the length of the holder with just a few clicks of the tool. Let’s start with the standard beading confi guration. With a standard beading confi guration, strengthening ribs and cross brakes can be added to sheet metal while still in the punch press. Let’s face it, creating cross brakes in a press brake is time consuming and not highly accurate. Why not use your punch press to add these features, eliminating the need for the press brake? Since cross brakes typically can’t be produced using a back gauge on a press brake, additional time is required to lay out the bend lines and, more importantly, hit these lines accurately when forming the cross brakes. Using the Mate Rollerball in the punch press eliminates the time consumed at the press brake, as well as increasing the accuracy of the location of these features. 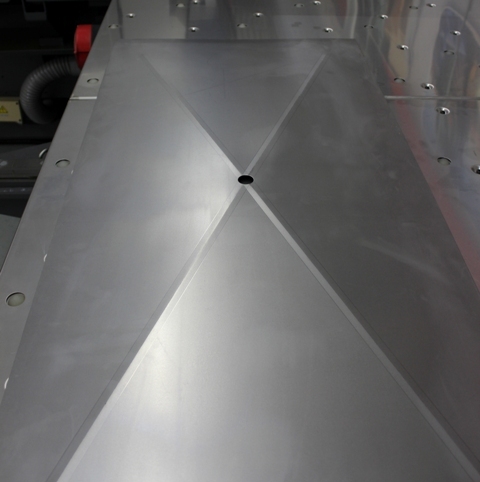 Formed ribs can add structural integrity to sheet metal, thus allowing parts to be fabricated using thinner material than called for in the original design. Thinner material equals cost savings in most cases. A formed rib courtesy of the Mate Rollerball can also replace a continuous rib formed by a standard forming tool. A standard forming tool might require tens to hundreds of hits and minutes to produce a strengthening rib over the length of a sheet. Using the Mate Rollerball may reduce those to just a few seconds and with a much better looking end result. When used in an auto index station, ribs can be added for cosmetic appearance as well. With a little bit of programming experience, logos or artistic impressions may be added to a sheet metal part, adding to the visual enhancement of the final product. The Mate Rollerball also comes with a shortened insert to create offset forms. Whether it’s for clearance required for additional features or existing hardware, perhaps a 3D appearance of the final product, or a subtle change in material levels, the offset feature of the Mate Rollerball can help. 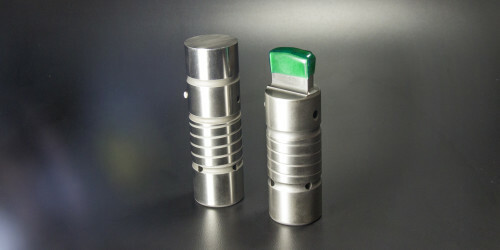 The offset configuration consists of one standard insert in the upper tool, and one shortened insert. This creates an offset or multilevel form. Depending on the location and direction of travel of the material, the result can be a formed upward or a formed downward offset.